In many respects, this revival shows how far the company has come. What was then an endearingly makeshift concert staging is now essentially a full-scale production. Dance numbers with elaborate choreography, once unimaginable in the short rehearsal period, have become a regular feature. Musical values are stronger than ever, with orchestral playing that would honor a prominent opera house or concert hall. Casting this time around was, for the most part, comparably strong to the exceptional first group, and in at least one case—Ben Davis as the senior heartthrob, Constantine—we had a major upgrade. Jason Gotay was an adorable, velvet-voiced Ken. Comic support from Brad Oscar, Adam Heller and Stanley Wayne Mathis was just right. In 1995, Tyne Daly brought lots of star power and really nailed the comedy; her characterful singing voice wasn’t entirely up to the challenges, but she knew how to deliver the material. This time, we had Carmen Cusack. She boasts a fine and more reliable singing voice, though her style has a few too many pop mannerisms for my taste. Her warmth and genuineness also work for the character’s unfiltered Oklahoma charm. But she lacks the kind of electric presence this part needs. Neither Daly nor Cusack is remotely like Ethel Merman, the role’s creatrix, who did everything her own way. (Merman never even gestured at Adams’ Oklahoma origins, god love her. Here as in many other roles, she channeled—in every sense—pure Queens.) Each had something of their own to bring to the party. Why, then, was the 2019 version ultimately a major letdown, and far more problematic and reductive than the earlier production? Read on and I’ll explain. First, though, a bit about the show and its composer. When Berlin wrote music and lyrics (Lindsay and Crouse provided the funny book) for Call Me Madam, his storied career, begun 40 years before, was in its twilight. Though he would live decades longer,Berlin wrote only one more complete show: the flop Mr. Presidentmore than ten years later. Still, this late work finds him at the top of his craft in several ways. Berlin’s career was founded in the world of revues, where he rose to prominence with two particularly precious skills: he could write perfect-fit material for specific star performers, and he could supply songs of all kinds—romantic, funny, even tragic—that encapsulate a moment. As for the second: that’s both a blessing and a problem here. Writing great songs—even across a wide spectrum of styles—isn’t the same thing as telling a story through a score, and it’s clear from Call Me Madam that, wonderful as Berlin is, he never fully realized the Rodgers and Hammerstein ideal of an integrated score completely in the service of a narrative. Yet who could resist this gloriously tuneful show, including at least one solid gold hit in the counterpoint “You’re Just in Love,” which the composer clearly and correctly anticipated would be a showstopper (he built in encores)? There’s also the graceful “It’s a Lovely Day Today,” the zippy “Washington Square Dance,” and many more. In Encores’ 1995 version, director Charles Repole and his company were content mostly to let those winning musical numbers speak for themselves. The show had an old-fashioned feel for sure, but it was endearing. If only the same could be said here. Instead, director Casey Hushion attempts to spice up Call Me Madam in ways that make it feel more than ever like an out-of-touch relic. Hushian and company frequently paint the Lichtenburgers in demeaning stereotypes. As Princess Maria, Lauren Worsham sings well, but she behaves like the horror movie cliché of a weird doll come to life, and (when she remembers to do it) throws in a Zsa Zsa Gabor accent. “The Ocarina,” Berlin’s attempt to evoke folksy charm and admittedly not his finest hour musically or lyrically, is rendered as a crazy dance number, cranked-up and artificial as any Disney animatronic ride. The irony of all this should be obvious. 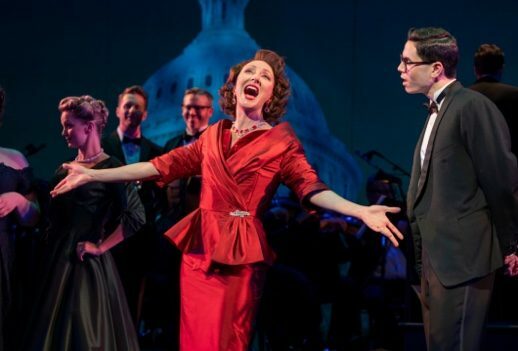 Choosing Call Me Madam was likely planned in part to capitalize on the anti-Trump sentiments easily perceptible in the audience. Yet the vision put forth in Hushion’s tone-deaf production—a Europe whose history and traditions are reduced to a kitschy Alpine Village theme park—could hardly be more Trumpian.